An enjoyable light and funny episode that is at its best when it isn't taking itself too seriously. Ironically - after two episodes of being a highlight - Capaldi's more serious Doctor is the weakest link in this episode. That's mostly due to a script by Mark Gatiss that leaves him acting more like Sherlock Holmes than any version of The Doctor we know but it's a minor point compared to the greater glory of a good story that will leave you wanting to believe that legends are real. Offered a chance to go anywhere and meet anyone, Clara asks if The Doctor can take her to meet Robin Hood. Impossible, The Doctor says. Robin Hood is a myth. He isn't real. He never was. 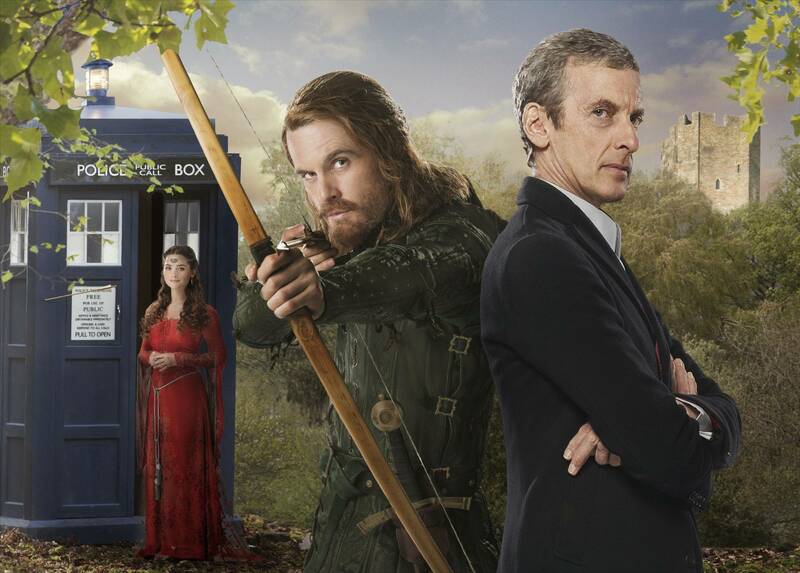 Still, The Doctor is willing to take Clara to Sherwood Forest around 1190-ish AD to prove the point... only to be confronted by an ever-laughing blonde bloke in green leathers with an immaculate beard and perfect aim. There's also a Sheriff in Nottingham who is enslaving the peasants and taking their gold but The Doctor is less concerned about this injustice than he is about proving that he's right. Yet even after The Doctor discovers a castle disguised as a spaceship and robots disguised as knights, he still can't disprove the existence of a flesh and blood Robert of Locksley. But in a time of impossible heroes, will it be The Impossible Girl who saves the day? * The casting for this episode's guest stars was perfect. Tom Riley is a picture-perfect Robin Hood and his Merry Men are all enjoyable for the all too brief moments we see them on-screen. Ben Miller is an amazing Sheriff of Nottingham, who plays the villain as a glorious ham of the same school as Anthony Ainley's Master but not quite so hammy as Alan Rickman's famous take on The Sheriff. One wishes BBC's most recent Robin Hood series had been more like this and one longs for a new Robin Hood spin-off to start with this cast. * The script by Mark Gatiss is one of the most fun Doctor Who scripts we've had in a long time. We get all the classic moments one would expect in a Robin Hood story (the duel on a log over a stream, the archery contest with a golden arrow as the prize, etc.) and Clara proves a grand expy of Marian as she undertakes all the tasks usually reserved for Marian in a Robin Hood story (i.e. milking the bad guy for information to tell Robin what he's up against). * More than any script so far this series, Robots of Sherwood defines The Doctor and how much he has changed after 1000 years in Trenzalore without resorting to contrivances such as The Doctor having to ask Clara if he is a good man or not. I believe most of the previous versions of The Doctor would be a bit more excited about meeting Robin Hood than they would be worried by the implications of his existence. Matt Smith would be jumping through the trees shouting "Geronimo!" in an instant. Tom Baker would smile and shake his hand vigorously excited at the honor of meeting such a great man. Even Jon Pertwee's more patriarchal Doctor would probably offer a polite greeting and inquire about a sparring match later on. This new Doctor is a skeptic and a scientist with little use for romance or fun. * Clara has gotten far more development in these past three episodes than she ever did during Series 7. Here, Clara acts like - for lack of a better term - a real person confronted with their childhood hero. Jenna Coleman plays the fangirl angle well, without ever going overboard. And her attitude in handling The Doctor as he complains about her usual skepticism dropping in the face of an Impossible Hero is perfectly played. * Along those lines, we see Clara acting like a school-teacher as Robin and The Doctor are acting like petulant schoolboys in the dungeon scene. There is much hilarity here, particularly in how Clara demands answers on exactly what their escape plans are in the same tone in which she might demand a particularly difficult student answer a problem at the blackboard. * It's an interesting change of pace for an episode in that, for once, The Doctor is the one lagging behind everyone else in his search for answers. The Merry Men are the first to notice how odd it is that The Sheriff and his "men" are only interested in acquiring gold as opposed to any other valuable or rare objects. And Clara proves far more effective in getting to the bottom of the mystery of what The Sheriff's game is. Indeed, Clara is the one who saves the day, forced into action when her heroes are rendered inactive. * This one is strictly personal, but The Doctor's duel with Robin Hood amused me for reasons beyond the writer's intent. This past summer, I ran a Doctor Who RPG for the teens at my local library. And one boy, informed that this was not the sort of game where you could arm yourself with all manner of guns or weapons and expect to win, asked if his character could always carry a spoon with him. I agreed to this. And circumstances contrived that this spoon would later prove to be useful in disabling a Cyber Controller. And me, playing The Doctor, told the companions "And let that be a lesson to all of us - always carry a spoon with you." * A subtle reference to the Classic Series - The Doctor claims to have studied swordplay with Richard the Lionheart, Cyrano De Bergerac and Errol Flynn. The First Doctor met Richard The Lionheart in The Crusades and The Second Doctor met Cyrano De Bergerac in The Land of Fiction in The Mind Robber. It's also worth noting that - like any historical Robin Hood that might have existed - these three men are better known today by the stories of their lives than the reality. * Another reference to the Classic Series and the Pertwee era - The Doctor speculates that they might be in a miniscope as he's trying to figure things out. * There are a lot of great lines in this episode, but none so grand as the final magical moment between The Doctor and Robin, where Robin lays out the moral of the episode - that it doesn't matter if a hero is real or not if the stories of that hero inspire others to become heroes - and continues the season-wide theme of whether or not The Doctor is a good man or a hero and recognizing that there is a difference between the two. * Capaldi's Doctor, for the first time, is a detriment to the story. His skepticism here seems largely arbitrary given some of the equally impossible things he has been confronted with before. This is a problem because as novel as it is for everyone else to be moving on with things around The Doctor, it is still worrying that he's digging for clues to prove himself right as everyone else is dealing with more pressing, serious issues. In this regard, Capaldi's Doctor greatly resembles William Hartnell's First Doctor, who was (in his first few appearances, at any rate) an academic more concerned with his studies than playing the hero. Of course Capaldi does finally play the hero but only after being convinced that not everyone around him are robots and that there is real danger to be found in the castle. * On that note, The Doctor here seems to be written like Sherlock Holmes - more concerned with being right and solving a mystery than he is with saving lives or thwarting evil. While The Doctor enjoys a good mystery, it should never be at the expense of other people's lives. * The dodgy sound effects strike again, with the Wilhelm Scream being used at one point. "History is a burden. Stories can make us fly." It is not without fault. But since the moral of this episode is that looking for fault in a story that inspires you is pointless and that a good heroic tale is worth the telling in itself, I shall say nothing more than this - Robot of Sherwood is a good, inspiring heroic tale.